Automattic has recently acquired Intense Debate. For those not familiar, Intense Debate takes the blog commenting system to a whole new level. Traditionally, blog commenting is linear, but with Intense Debate, commenting becomes more like a social site. It allows threaded comments, user profiles, comment voting/reputation points (think Digg or Reddit), as well as integration with other social sites. Also, when you make a comment, it can automatically send an update to Twitter or Facebook. From a strategic perspective, we like technologies that can push the curve of user generated technology – making blogging more authentic. A lot of these things will likely be folded into the Buddypress project (http://buddypress.org), but we’re hoping they’ll make it into WordPress itself in a future version. A service like Intense Debate should do great things to improve the entire commenting and blogging experience. You can read more on Automattic’s acquisition by clicking here. The way they collect the data (at least KeyCompete) is that they are constantly doing automated searches on all kinds of keywords to see who is advertising on what keywords. Since these are done automatically, and by the millions, Google’s servers are made to work and Google gets no benefit. Both of these are great services, though, that Viewstream uses to help in our competitive and market research. This allows us to better formulate the right language around your brand, and optimize organic and paid search. More and more, the ability to define keywords and integrate within organic and paid search is one of the most critical aspects of creating competitive differentiation in today’s marketplace. Viewstream tries to extend the value of those keywords to the entire, integrated brand message. Flash is a notorious memory hog — and Viewstream developers are always looking at the implications of flash animations on processor performance. You will probably know what we are talking about if you have multiple browser windows open with youtube videos, flash animations, and other sites: your computer will crawl to a halt. The party line at Viewstream is that we support all three technologies, depending on the client, and depending on the client’s requirements. Until Microsoft, Google or Adobe, invest millions in our development teams, we will be experts in all three — and continue to determine technology choices based on client needs. Isn’t that the way it ought to be? Dell has lost its bid to trademark the buzzword “cloud computing.” The USPTO declared “cloud computing” to be a generic term largely because of Dell hardly being top of mind when thinking of “cloud computing.” Cloud computing is a broad category – and nobody thinks of Dell when it comes to cloud computing – maybe you think of Amazon (the S3 service) or Salesforce (they have done the awareness campaigns), but not Dell. Dell’s application was officially rejected mid-August: check out this article: The Register. Also, check out Microsoft’s Cloud offering: https://www.mesh.com/Welcome/LearnMore.aspx And we would like to thank the development company for using Silverlight in the product tour – we have seen too many Microsoft projects done with Flash. We love Flash and we love Silverlight – but please, if you are doing work for Microsoft and you don’t have Silverlight developers, give us a call! Think Vitamin recently published a solid article that outlines the “five hidden costs” of running a CMS. These hidden costs are a function of your business model, your website requirements, and technical level of your team. At Viewstream, we have seen both sides of the coin, clients who do really well and save a lot of money with CMS, and then others who get stuck with bad systems and poor code that require complete redevelopment. We recommend a reputable agency or consultant to determine your website requirements in the context of you business objectives before you make a decision. My advice to clients is be risk adverse, treat a CMS decision as any other business decision in terms of best practice decision making process, and give your organization plenty of time to make the right choice. Because many CMS systems inject a code layer between the html and the cms edit functions, once you install and integrate your CMS, it is pretty much a complete website redo if you decide to change your CMS later. Also, your CMS imputes a certain website code structure onto your site, one that is also not easy to modify in the case of new business requirements, marketing initiatives, and the myriad other forces at work that influence your website. Viewstream has developed and worked with many CMS systems â€“ and we recommend MODx, WordPress, and Clickability. With all the hype today about social media and conversational marketing, companies need to keep in mind marketing basics about who your customer is and how you reach them before quickly engaging a social media strategy. Blogs may not be right for every company — and conversational marketing just might not be perfect for your customers. So before you jump onto the social media bandwagon, take a close look at your business model, your current customers, how your customers engage and your growth objectives. With that said, the list of social media marketing tools is growing, and companies like Viewstream are certainly benefiting with the growing interest in our solutions. Viewstream is particularly strong on the digital media side, including screencasts, social media videos, community videos, podcasts, HD videos, embeddable web videos, and product demonstration overviews. Beyond content marketing videos, digital video content that considers the landscape of your solution, and positions your company within this landscape, can be more powerful then a sales video. At the end of the day, social media is about building a stronger relationship with your customers, and more easily attract new ones. But like any marketing strategy, it needs to conform to how you do your business. Just a reminder – before you jump on the bandwagon! Google has announced significant improvements in its ability to index Flash files. We imagine a collective sigh of relief, as this would solve one of the key development issues we come across in doing creative work–getting the bots to read the increasing percentage of Flash content and widgets on web sites. Can someone from Google please say, “It supports SWFObject”? People are, of course, asking questions. But Google is holding off on giving answers. This discussion is important as it relates to SEO done in conjunction with SWFObject. We may assume that search bots are reading the HTML page and NOT the Flash, while users get the actual Flash content. But isÂ Google now also indexing some random bits and pieces from the Flash as well? It apparently is, but at what level? There is a good discussion of these issues on Sitepoint. Today I attended the Tour de Force — a Salesforce promotional event that introduces the “platform” as a service solution. The Cloud Computing space is loaded with vendors — and I am willing to bet my house that this is the real deal — what people will call Web 3.0 — and make web 2.0 look very small. I told you that I drank the kool-aid! Essentially, this solution allows you to quickly develop enterprise level software using the shared “cloud” resources of salesforce’s infrastructure. Cloud computing is when the datacenter becomes virtualized, and servers are no longer thought of as unique entities, but an array of systems that function together and offer all the foundation services (infrastructure, billing, security, content, database functions, etc.) you need to build an online software service. Now, developers will have an integrated platform to build, test, and deploy applications — with shared code and resources the benefits are immense. This really lowers the barrier to entry for software — and from a business perspective enables what I call the “short tail” — where your business solution can be offered to any size business in any market. When you have an Amazon or Google or Salesforce infrastructure behind you, you can scale ad infinitum. Or sell to one. Revolutionary. 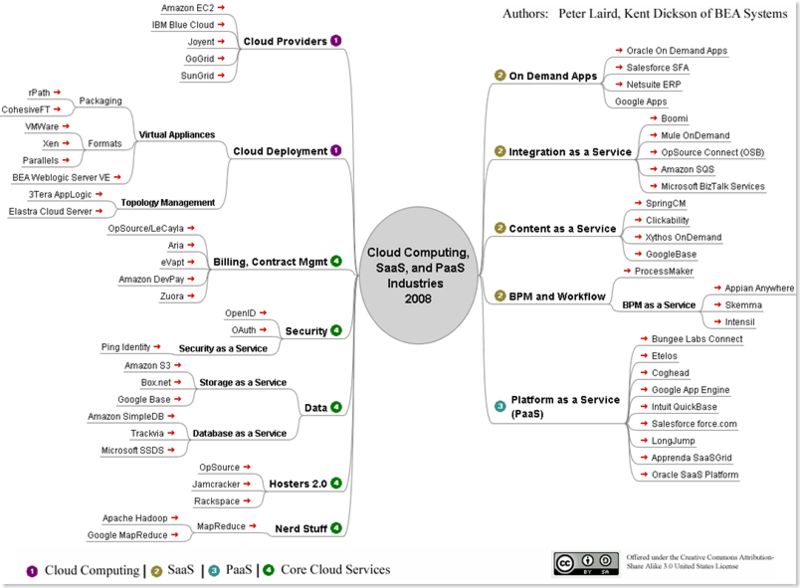 Here’s an image from Peter Laird’s blog that provides a great landscape of what is going on. For the past two years, Viewstream has provided proprietary networking and display systems for HP and The Kenwood Group events. Our system, developed in-house, allows audience members to send questions via text message or e-mail, which were processed and displayed on the main screen in real time. 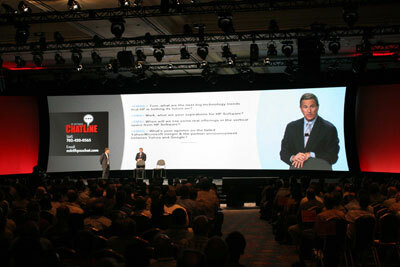 Most recently, we were in Las Vegas for the 2008 HP Software Universe Conference. Check out the photos to see our technology in action! Images courtesy of The Kenwood Group. Over 50% of users don’t read past the first results page (btw, interesting fact: men tend to go past the first couple of pages more than women). If you are not on the top of the results (paid or organic) there is limited value. There are some changing search engine interfaces that reinforce these two facts. Space Time has a cool product and is developing alternative methods of reviewing and selecting your webpage, photo, and video search results. By presenting the pages in 3-D, results are stacked in an open space to be shuffled and organized visually. The Economist had a good article about the changing trends in search engines. What we see happening in the future is a new segment of search, that is search as entertainment. We recommend our clients pay more and more attention to search optimization (with consideration for new search engines) as well as website design creative to truly stand out. Media-based design using video, vector and motion graphics has more and more value in this information as entertainment world. As always, the surfing patterns of your customers is what counts, so each situation needs to be considered on a case-by-case basis. Viewstream can help with your search marketing and search engine optimization in the ever changing world of search. Give us a shout!